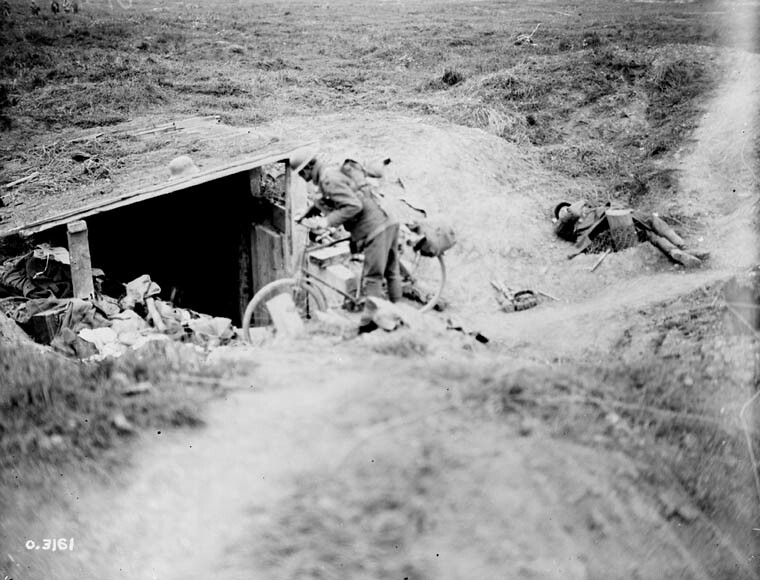 A Canadian cyclist shouting down a German dugout during the 2nd Battle of Arras. The Battle of Arras (also known as the Second Battle of Arras) was a British offensive on the Western Front during World War I. From 9 April to 16 May 1917, British troops attacked German defences near the French city of Arras on the Western Front. The British achieved the longest advance since trench warfare had begun, surpassing the record set by the French Sixth Army on 1 July 1916. The British advance slowed in the next few days and the German defence recovered. The battle became a costly stalemate for both sides and by the end of the battle, the British Third and First Armies had suffered about 160,000 and the German 6th Army about 125,000 casualties. Infantrymen of The North Nova Scotia Highlanders aboard LCI(L) 135 of the 2nd Canadian (262nd RN) Flotilla during Exercise FABIUS III, Southampton, England, ca. 1 May 1944.